Negotiation is for those who don’t attack enough. At least that’s what Goblin Diplomats think. Today is the sixth (and final?) edition of our EDH Player Psychographic series. We’ve covered Herm/Hermettes, Turtles, Mackenzies, Barktooths, and Puppet Masters. To round things out, we’ll take a look at perhaps the most extreme psychographic there is: the Goblin Diplomat, or GD for short. What is a Goblin Diplomat? I chose this card as the namesake of the psychographic because its rules text perfectly embodies the ethos of this type of player (plus, the art and flavor are all-time great). 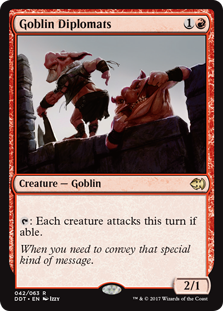 Goblin Diplomats are those players who eschew politics and negotiation in favor of raw aggression. Games with GDs are often chaotic, action-packed, and fast. So much for that eight drop you wanted to cast. Now some might say that politics are an essential ingredient for winning. They might tell you that aggro decks aren’t good in EDH, and that decks that win by attacking aren’t that good. Those are the players you’re most likely to attack first. As always, the EDHREC themes tab is an excellent place to find players of this psychographic. The place I’m starting is the Extra Combat theme. Though we’re not seeing huge numbers with any specific commander, the total gives us a good idea of the number of GDs on EDHREC. After all, if you’re playing any of the decks that fit this theme, you are most certainly a Goblin Diplomat. As of the writing of this article, that’s 484 GDs. But that’s not all. What about the Group Slug theme? As you can see, this grouping is a bit different, yet it still aligns with the spirit of GDs. Mogis, God of Slaughter, Heartless Hidetsugu, and Zo-Zu the Punisher all suggest less of an “I attack you” theme in favor of burn. However, I’d say that still aligns with the values of most GDs. Attacking causes damage, burn causes damage. Either way, that’s how GDs conclude negotiations. As you can see, these commanders are pretty darn popular. If you’re playing any of them, you very well may be a GD. Now, in terms of gameplay, what’s it like to be a GD, and what’s it like to play against them? Let’s take a look. It’s pretty simple. If you’re a Goblin Diplomat, things are fun. If you’re playing against a Goblin Diplomat, things are stressful. That said, I actually kind of enjoy playing with GDs. I myself am a Herm with a smidge of Barktooth, so sometimes I end up playing durdley decks that take a long time to get going. When everyone at the table’s doing that, games can feel pretty stale. GDs inject a sense of urgency into the table. They’re sort of analogous to the mono-red deck in Cube; you can play nonsense, but not too much nonsense. GDs tend to go after players without blockers or those they view as the biggest threats at the table. Though they aren’t political, GDs usually offer rational explanations for their attacks when asked. For example, your opponent casts their shiny new Tajic, Legion’s Edge and immediately attacks you. You ask the classic question, “Why me?” The GD will probably say something like, “Well, you’re the only player with a Sol Ring, so I thought it was only fair.” There you go. If there’s a GD in your playgroup, I recommend paying close attention to both their board and your own. Yes, opposing GDs can be life-threatening if you don’t come prepared. But if you do, they can actually become assets. If you know you’re playing a GD, prioritize casting a blocker over that mana rock. It could divert an attack to one of your opponents. Gotta like that! GDs usually win games of EDH through extra combat steps. This makes sense, considering there are extra players at the table. A single combat step just isn’t going to do it. You might also see GDs winning with traditional Voltron strategies. And then there are also infect decks. Basically, GDs win with big attacks. That’s the name of the game! 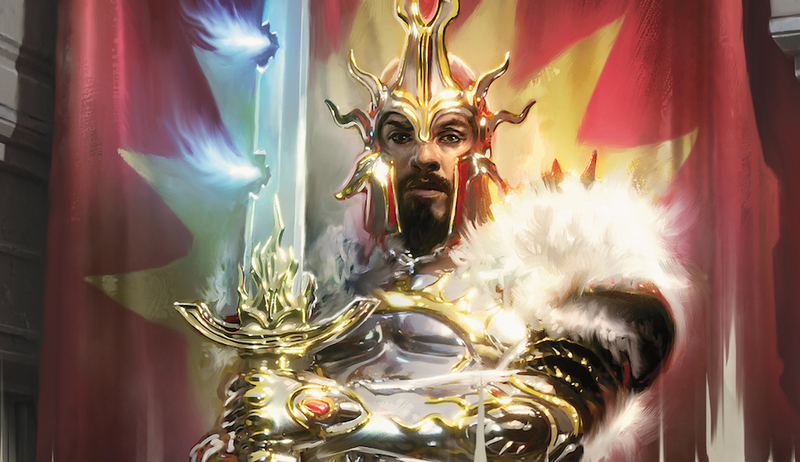 New Boros commanders make you happy instead of sad. You prefer your creatures tapped (unless they have vigilance). 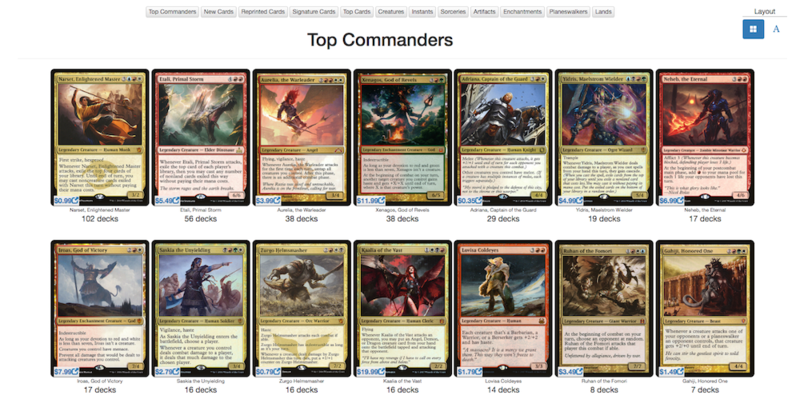 You dig 7-power commanders because they only take three attacks to kill an opponent. You beat up on Turtles as a matter of general principle. You can’t abide their life choices. You’ve never played a card without the word “attack” on it. Are you a Goblin Diplomat? If so, attack that comment box below! Kyle Massa is a writer and avid Magic player living somewhere in upstate New York with his wife and their two cats. His current favorite card is Feather, duh. Kyle can be found on Twitter @mindofkyleam.